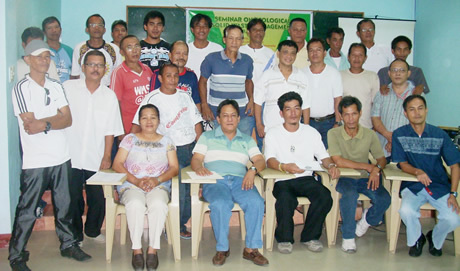 Participants of the seminar pose with the resource persons: Prof. Ardel Barre (standing, 2nd from left); Prof. Fredelino San Juan (seated, rightmost); and Mr. Alfredo Montero, supply officer. The College of Forestry and Environmental Studies (CFES) of the Western Mindanao State University (WMSU), in coordination with the Office of the Director for Administration, conducted a Seminar on Ecological Waste Management among WMSU’s utility workers and janitors on April 23 at the College of Law Moot Court, main campus, this city, in connection with this year’s celebration of Earth Month. The seminar aimed to create awareness regarding RA 9003 in relation to the climate change scenario; gather information regarding the present system of waste disposal in the university; and develop a doable solid waste management strategy/plan for the University. Topics taken up were the Salient Features of Republic Act 9003 otherwise known as the Solid Waste Management Act of 2000 in relation to climate change; and Environmental Pollution which were given by CFES Dean Prof. Fredelino M. San Juan and Prof. Ardel S. Barre, Chair, Environmental Studies Department, CFES, respectively. Both professors San Juan and Barre underscored the urgency of formulating a doable and sustainable solid waste management plan for the University which will involve the cooperation of the following stakeholders: canteen operators; teachers; students; and staff, particularly the utility workers. A film on climate change was shown. Likewise, there was a video showing on the establishment of a material recovery facility (MRF) which requires segregation of solid waste at the source – household, office, eatery, or any establishment. It also advocates for the reduction, recycling and reuse of non-biodegradable solid waste to lessen the volume being dumped everyday. Most of all, it proposes ways of composting biodegradable materials such as leaves, left-over food and the like using discarded cans, drums, and other containers. A situationer given by Mr. Efren Montero, WMSU supply officer, revealed that the University is yet to formulate and implement a comprehensive sustainable solid waste management program. In a workshop that followed, the participants identified paper; leaves, twigs and branches; plastics; styrofoar; bottles; and chemicals among the major solid wastes in the school. They likewise proposed for the creation of a solid waste management team that would oversee the implementation of a sustainable solid waste management in the campus. During the closing ceremony, the participants signed a statement of commitment to seal their support for any solid waste management efforts and programs that the University will undertake.